Luxurious Home, Built in 2000 and recently remodelled. Great Room with Magnificent Views of Pool, Deck and Conservation Area. 42-inTV Chef's Kitchen with Modern Appliances, Dishwasher, Range. Hall. Master Bedroom (King) with awesome Pool Views & LCD TV. Tub & Walk-In Shower. Guest Room (Queen) with adjoining full Bathroom. Bunk Bedroom, & 2 Twin Bedrooms. 3rd Full bathroom with door to pool deck. Extended Paved Deck, Swimming Pool & Spa and Luxury Padded Deck Furniture. Gas BBQ. Free Wi-Fi Access, phone & Cable TV. AC, Security System. In-Wall Pest Defense. Wheelchair accessible with pool hoist. approx 15 Mins Beach to Disney World, 20Mins Universal , 30 Mins Orlando Airport, 60 Mins Tampa Airport, 75 Mins Busch Gardens, approx. 2 hours to Beaches. •	Sleeps 11 in comfort. Fabulous Range of In-House Entertainment. The fully screened pool deck ensures that your outdoor activities remain “bug free” and for the ultimate indulgence, our brand new hot tub will provide a welcoming aquatic massage to ease your aching muscles after all that time spent in and around those mind blowing theme parks. Heating to a temperature of 104 degree F, we lay claim to no ordinary spa - this is the luxury you only get with a superb Hot Tub!! Soak away the aching limbs with wine glass in hand. Use the tub day and night. Complete with varying coloured lights, its the perfect accessory for your perfect Florida Vacation at the perfect villa for you! The villa enjoys the great benefits of open plan layout, with the lounge at the “epicentre.” This is ideal for large groups. This delightfully sunny room with open views to the glistening pool and lush conservation beyond, is the perfect place to relax and unwind. The golden tones of our luxurious furnishings and complimenting decorative lamps and accents present a calming ambiance and afford a welcome retreat from the glorious Florida sunshine. Ideal in every way for large parties up to 11 people, this really is your perfect holiday home from home! There is also a large communal pool in the Highlands Reserve community, along with a children's play area with climbing frame etc. Other activities nearby include golf, walking and tennis. A Cot and Highchair are available in the villa as are a PlayStation 2 and a few games and DVDs. •	A Superior and Prestigious Development!!! Highlands Reserve is just 2 minutes drive away from major grocery supermarkets and only 5 minutes away from two new major non food shopping outlets. Situated just off Highway 27 the villa is conveniently positioned for access to 'The 192' and the I4 road network. 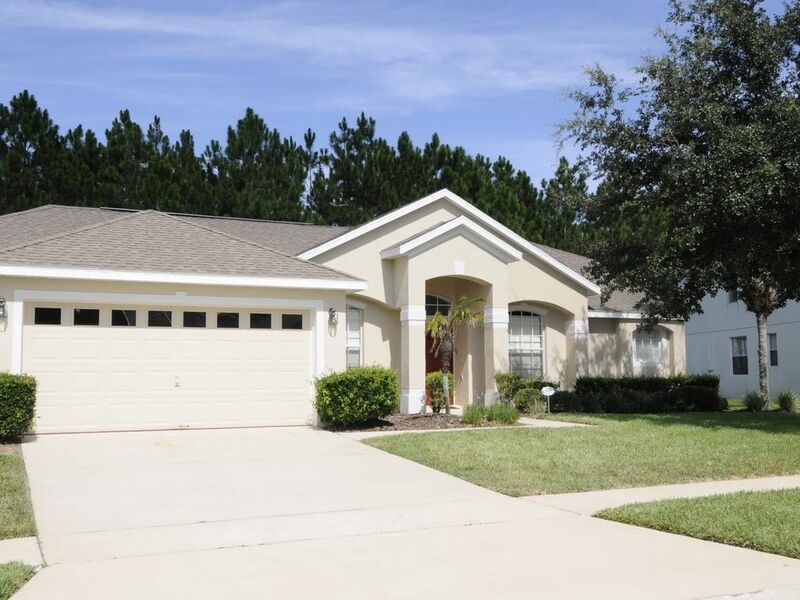 The home is ideally positioned just 12 minutes drive away from the Disney resort and 25 minutes journey from the Universal Studios complex. Fantastic Beaches on both East and West coast are an easy 70 minute drive away. Orlando Villa Paradise enjoys the benefiys of a Conservation Plot, with all day sunshine on the extended deck.